This one is from those moldy Betas from PA and hurts the most out of them all. The cover, case, and cassette are in excellent shape, but the damn tape looks like someone dunked it in a box of white powdered Munchkins. I haven't actually seen this sequel since I've always heard it's pretty mediocre. This cover rocks though and it's one of my favorites from Thorn EMI. It's bold and colorful handdrawn design recalls a series of the video company's releases from the British studio HandMade Films. When Cannon bought Thorn EMI's film catalog in 1986, HBO/Cannon Films re-released this in a regular cardboard case as opposed to a white clamshell. That cover is badass but the movie suuuuuuucks. Nice. 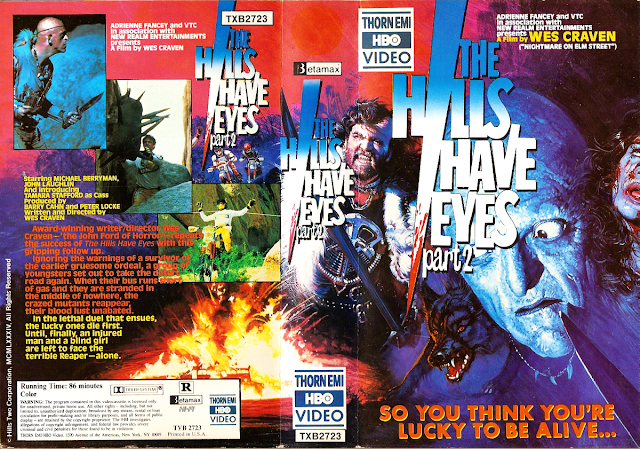 That is the cover I remember from the VHS stores of my youth. It is so beautifully colored and awesome. But yeah, ditto on the film's quality. Hi Jason, I really want to know who did this artwork. Do you have any idea please?